Your choices are wide open when it comes to selecting new windows. We’ve created this 3 part series to provide helpful tips & ideas to make your options a little clearer. Let’s begin with how you are going to use your new windows. Where will they be? Who will operate them? Choose with purpose. For a kitchen window over a sink or counter, a horizontal sliding window lets in light and is easy to open. Awning windows provide a great option for ventilation during rains. They open outward and provide shielding for the window opening. Like horizontal sliding windows, they also can be a good choice above a sink or counter—their crank systems allow for easy one-handed operation. Some double hung window models have tilt-in sashes for easy cleaning. In second- and third-story rooms, these windows save you from having to haul out a ladder to clean your windows. Think about what furniture or other furnishings you might put in front of a window or patio door inside your house. For instance, if a table is going to be placed in front of a window, consider a casement window that can be opened and closed with one hand from a crank at the bottom. For a French patio door, if your interior space near it would conflict with an in-swing door, consider an out-swing or sliding door. On first floors, look into combinations of picture and awning or casement windows. These windows are difficult to pry open when locked. For a living room, consider combos of awning windows above or below a picture window. For a bathroom window or windows flanking an entry, look for privacy/obscure glass options. These provide privacy without the need for window coverings. Local building codes usually have entry requirements for bedrooms, specifying the size and height of an opening in the event of a fire or other emergency. Often, casement or sliding horizontal windows can be a good choice for meeting these codes. A basement window can be a challenge regarding accessibility. Horizontal sliders are an excellent way to achieve ventilation and permit-required access in window wells. If you have walkways around your home, you may want to consider windows that don’t open out into the path. Is your home situated near a highway, airport or other noisy location? Look into sound control windows. Removing screens for cleaning should be simple and effortless. Window and door hardware should be easy to use. Consider the hardware for its ease of use – such as the SmartTouch® window lock and door handle. You also want to be able to clearly see if a window is locked. It’s never good to find out an expected locked entry actually isn’t. 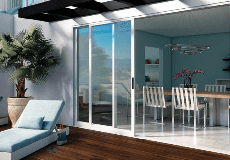 Now that you know all about window and patio door functionality, it’s time to think about style.